Our next destination at Island Profiles is the Florida Keys. Stretching 120 miles from the Atlantic to the Gulf of Mexico, there are 1,700 islands overall, but only 43 are connected by the 42 bridges of the Overseas Highway, one of the longest over water roads on the planet. The word key comes from the Spanish word cayo, meaning ‘small island’. 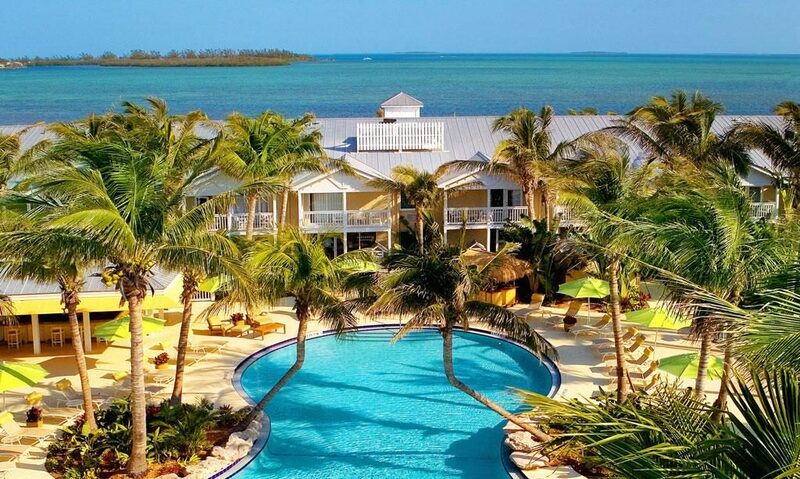 There are numerous other keys along the Florida coastline, but our focus will be the group of islands stretching from Key Largo, the largest of the keys which sits just off the tip of southern Florida, to Key West, the most famous and most populated of the keys. Well known for key lime pie, conch fritters and a laid back approach to life, the keys are one of the USA’s biggest tourist destinations. Tropical palms, hibiscus and bougainvillea abound and there are countless white sand beaches and state parks, where among the mangroves, sea grass and coral reefs, you will find dolphins, sea turtles, manatees, and of course, alligators. 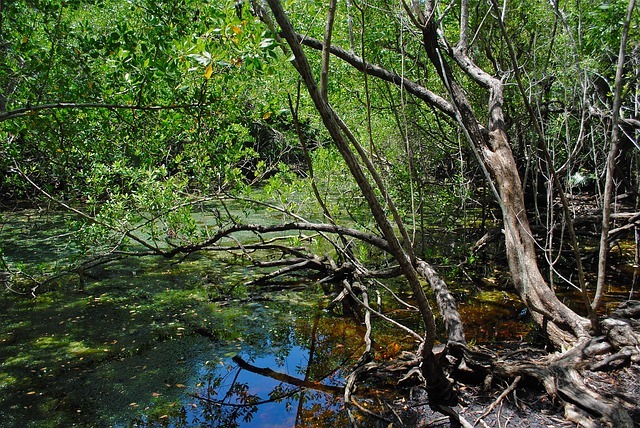 The earliest inhabitants of the keys were the Calusa and Tequesta tribes. In 1513, Ponce de León, the Spanish explorer, was the first to visit the islands. Settlement began in 1822. 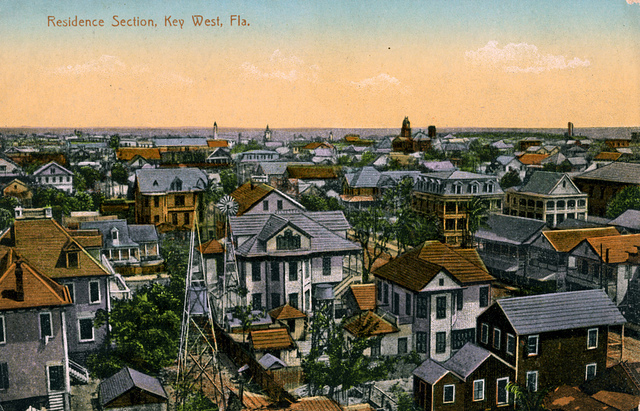 Key West, which is closer to Cuba than it is to Miami rose to prominence through fishing and the ‘wreck trade’, an industry based on the numerous shipwrecks in the area. Of course it was a favorite hangout of pirates who would prey on the Spanish galleons carrying gold from Central America. 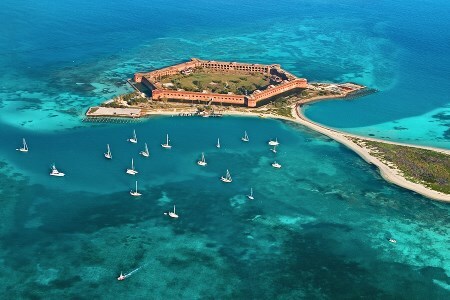 In 1846, Fort Jefferson was built on the Dry Tortugas, which are even further west from Key West and only 90 miles from Cuba. Although never fully completed or armed, the Fort, which is now a National Park, was built as a defense from potential enemies along one of the busiest shipping lanes of the time. It is the largest brick masonry structure in the Americas and offered refuge, protection and supplies to passing ships. It has also been used as a prison and a coaling station for warships. In 1912 a railway was built connecting the keys. When it was destroyed in 1935 by the devastating Labor Day Hurricane, what remained of the railway was purchased by the state and incorporated into the Overseas Highway which had begun construction in the mid 1920s. The full highway linking all the keys together with the mainland opened on March 29, 1938 as the southernmost stretch of U.S. Highway 1. 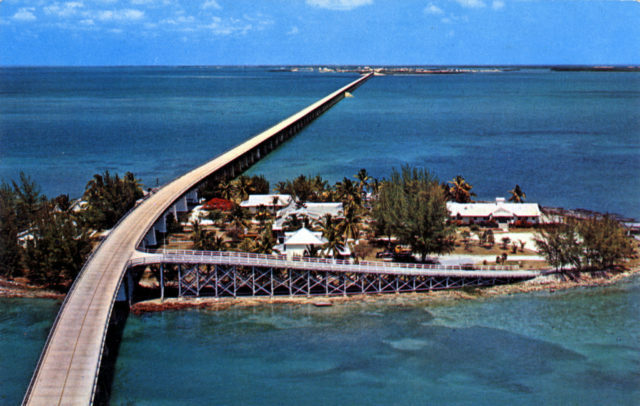 The construction of the Seven Mile Bridge made the highway one of the world’s longest over water roads. separated from the lower keys by the Seven Mile Bridge. 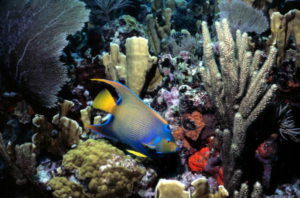 The lower keys include Cudjoe Key, Bahia Honda, Sugarloaf, Boca Chica, Stock Island and, of course, Key West. 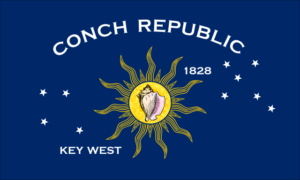 Retaining the name ‘Conch Republic’ from a protest against excessive border patrol searches of vehicles travelling to and from Key West, in which the island ‘seceded’ from the USA and actually declared war, the islanders continue to call themselves ‘conchs’. With a population of around 27,000 ‘conchs’, Key West is known for sunsets at Mallory Square, the shops, bars and restaurants on Duval Street, the Hemingway house and a whole lot more. 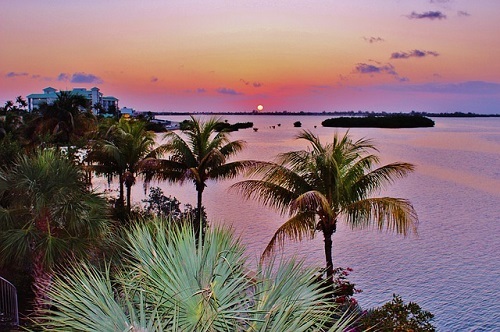 Island Profiles is excited to explore the history, culture, sights and attractions of the beautiful Florida Keys.